Who will be your valentine this year? A spouse, a friend, a family member? The tradition of sending someone a special ‘I love you’ on February 14th has grown in popularity (and profitability) worldwide. The more people we love, the more cards we buy! Nonetheless, if we look beyond the commercial clutter, we see that tender words do not fail to warm the heart. And when that special someone is hundreds or thousands of kilometres away, a simple ‘I love you’ can melt away the distances…and maybe even some of the horrors of war. soldiers – they are festooned with hearts, uniformed figures, ribbons and flags. Some came from overseas or from Canadian training camps, carrying vows of love and words of comfort from soldiers who dreamt that love would one day triumph over war. 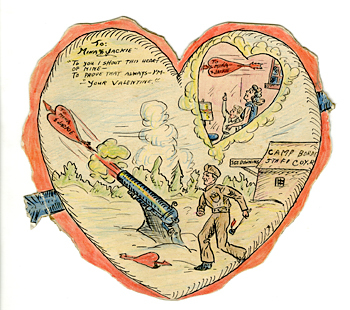 One of these cards draws particular attention – a heart cut from a simple piece of cardboard, with a few skillful pen strokes that paint a touching and funny scene of a soldier firing a heart from a cannon. An inset shows a drawing of his wife and child at home receiving the ‘cannonball’ heart through the window. This is a valentine card sent in the early 40s by John Percival Downing, member of the 5th Field Company of the Royal Canadian Engineers, to his wife Mina and son Jackie. Downing, who was posted at Camp Borden in Ontario, was preparing his departure for England and thought it best to sprinkle a sugar dusting of humour on an otherwise bitter farewell. Once in Europe, Sergeant Downing sent cards, telegrams and poems to his beloved. On February 15th, 1944 we can read these words: “Writing regularly – Anxiety unnecessary – Love & kisses.” Four months later, he died at age 31 on Juno beach during D Day operations. Faced with his eternal absence, Downing’s wife treasured these last love notes from her sweetheart. She finally donated them to the Museum so they could be preserved forever. Sometimes an ‘I love you’ can resonate forever in a shattered heart. But the words ‘I love you’ can also help put the pieces back together. For several years, the Canadian War Museum has teamed up with the Ministry of Veteran’s Affairs in a special labour of love. A project launched in 1989 by advice columnist Ann Landers and taken over by Veteran’s Affairs after her demise, Valentines for Vets encourages Canadians to send valentine cards to veterans in care facilities. The program is a success. Thousands of valentine cards have been sent by young and old in classrooms and living rooms to veterans across the country – a testament to the love, admiration and appreciation earned by those who fought in the service of Canada.